A few weeks ago, I was at one of my favorite restaurants. It was at the beginning of the evening rush and the parking lot was about three-quarters full. Someone had taken up two parking places. Such behavior is consistent with Narcissistic Personality Disorder (NPD). Before I walked in, I thought it may be a useful Body Language exercise to try and predict, to which customer this vehicle belonged. It took me less than 10 seconds to identify my number one suspect. His nonverbal signals were also narcissistic. One body language cue was the way he was speaking on and holding his cell phone. See Negotiation and Dating Secret # 111: The Great Phone Tell. 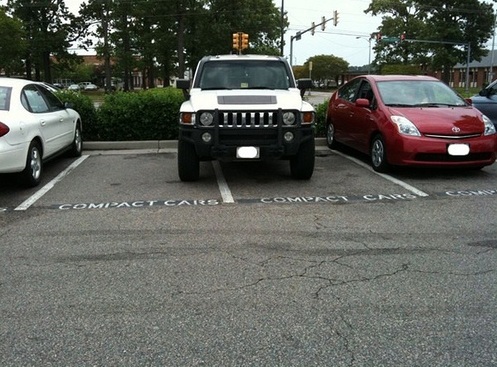 Do you ever park like this? How do you hold your cell when speaking on it? This obviously is not the only nonverbal sign of Narcissism, but in this case it was 100% predictive. What are some other Body Language signals of NPD?